"Sampath Speaking" - the thoughts of an Insurer from Thiruvallikkeni: Chennai Nov 2017 ~ continuous rains ... and people's fears !!! Chennai Nov 2017 ~ continuous rains ... and people's fears !!! I am no weatherman but a simple blogger – after such continuous rains from almost 6 pm last night, ventured out this morning to see that Triplicane is normal - cattle roaming, people waiting for milk, buses running, no water stagnation (at least in main roads as I could see) – yet no denial of the fact that the city has received almost 15 cm in past 10 hours or so. Kairavini pushkarini at Thiruvallikkeni, the temple pond of Sri Parthasarathi swami has received copious inflow – though some inlets are not proper. First thank sanitary workers like this man, who are out never thinking of self, but of cleaning ! 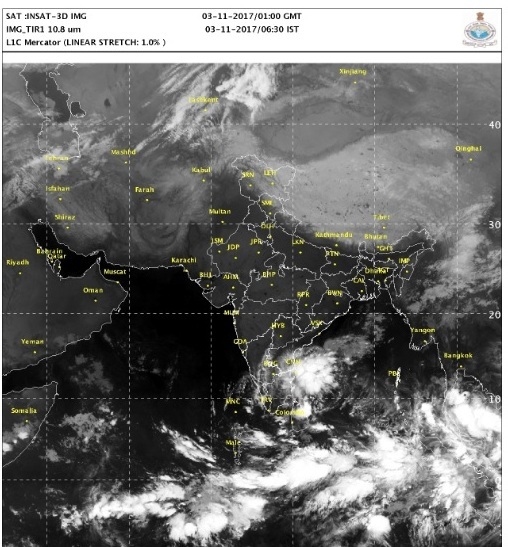 The satellite map is a bit worrying – there is low pressure area over Sri Lanka and adjoining southwest Bay of Bengal – weather report states that the associated cyclonic circulation extending upto 5.8 km above mean sea level also persistsing. Not so near, the low pressure area over Gulf of Siam and adjoining Malay Peninsula coast persists and could emerge into Andaman Sea during next 48 hour. Forecasts vary as to the level of strengthening of the 'low,' of which the IMD update does not give any indication. Thai Met Department had pointed to a depression within its territorial waters. The IMD also said that the persisting cyclonic circulation over Sri Lanka and the Gulf of Mannar has grown its reach to the rear to bring the South-West Bay of Bengal under its footprint. The US Climate Prediction centre records that this 'low' could in turn induce the incoming 'low' from the Andaman Sea to merge with it and approach the Tamil Nadu/Andhra Pradesh coast. We may never be able to interpret the reports – though this latest one @ 0630 am this morning shows lots of clouds. On factual side, rain lashed the city for several hours from 6 p.m. on Thursday throwing normal life out of gear. It caused flooding on many roads -subways were closed for traffic and motorists had to struggle with poor visibility. Following a rain forecast for Friday, the Collectors of Chennai, Tiruvallur and Kancheepuram have declared a holiday for schools. The rain affected the movement of several flights at Chennai airport and slowed down local trains on the Chennai Beach-Tambaram route; MRTS is operating this morning. Though widespread rains had been forecast for Tamilnadu, it was a bit warmer in the afternoon and there was sun shine too but around 3 pm there were sharp showers on 2.11.2017 – thence continuous heavy rains from around 6 pm troubling the public making difficult to return back. A TV channel puts that Velachery recorded 19 cm of rains ! Now with slight drizzle (@ around 07.30 am on 3.11.2017) it appears that mighty show has come to an end. We may get to hear stories of hardship, waterlogging, people experiencing trouble, property losses and more – hope we don’t .. media is trying to paint it as a grim reminder of 2015 Chennai floods. From a limited perspective, Triplicane appears as normal though am apprehensive of passing through some areas like Royapettah / Mirsahibpet – on the day when torrential rain lashed the city throwing normal life completely out of gear, Chief Minister Edappadi K. Palaniswami assigned Ministers and officials zones of the Greater Chennai Corporation and Kancheepuram districts to coordinate relief operations. At a review meeting at the Secretariat @ late hours on Thursday, the Chief Minister instructed officials to ensure relief operations and preparatory efforts efficiently on a war footing. In addition to IAS officers, the 15 zones of the Corporation will be supervised by Ministers, he said.